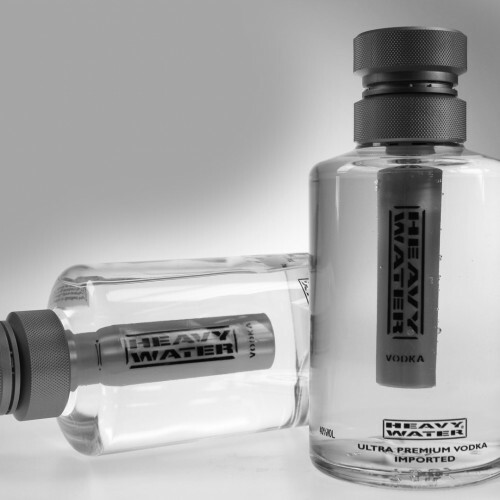 Heavy Water is a handcrafted, higher definition of vodka. 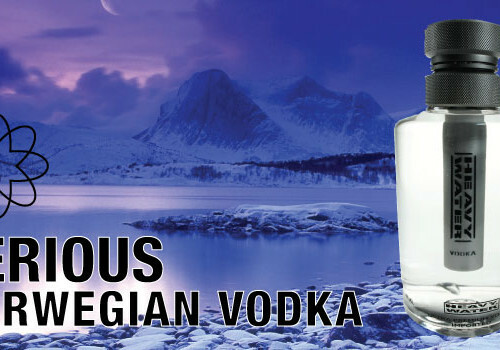 Made from the finest Scandinavian winter wheat and the purest Swedish water, it’s truly artisanal vodka. Every detail is crafted to maintain the essence of vodka’s true characters while adding modern touches. The bottle was designed by a Swedish artist. The glass is from Saver, the finest glassmaker in France. The rod is created of high-tech composites in Italy. Heavy Water puts elegance and education at the forefront; we aspire to be classy, while helping to put vodka on the same level of sophistication as the finest wines on the market. 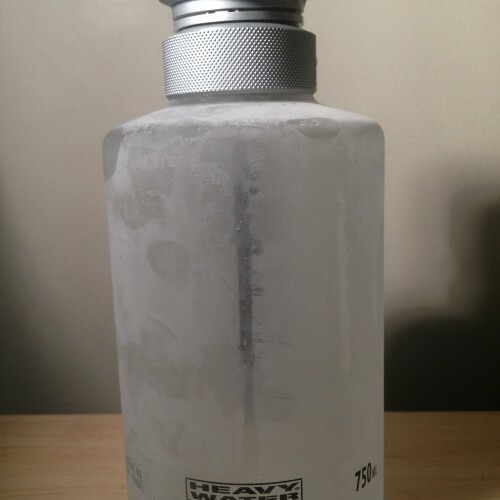 Heavy Water Vodka is Scandinavian. It is made with Scandinavian winter wheat – which is wheat harvested 6 months later than regular wheat, thus contains a higher level of starch, which in turn produces a higher level and quality vodka. Wheat vodkas generally create a spirit with a slightly sweeter taste, sometimes containing hints of fennel, licorice and powdered sugar notes on the nose and palate. It generally is a much lighter and smoother style than vodkas produced from potatoes and rye – which traditionally contains more vegetal and peppery characters. Wheat vodkas, specifically Heavy Water – is a perfect beverage for somebody who loves martini vodka straight up or on the rocks. Enjoy it as a stand-alone beverage, to fully take advantage of the super premium quality of this vodka! We distilled it once, twice, all the way up to ten times. Then we blind tasted the samples. This was a revelation. Ten times distilled produced just as bad of a vodka as one time distilled. It was stripped, bland, and medicinal. So we tasted backwards until we discovered the ideal number of distillations, Heavy Water is distilled more than 5 times, its destilled to perfection. After all, we’re not making grain neutral spirits. We’re making vodka. The water is from an underground lake that originates back from the last Ice Age, 5-10,000 years ago, which was recently discovered under the Swedish countryside. The water comes from the same water source that the first King Christian of Sweden was baptized in more than a thousand years ago. In this same vein, the water used to make Heavy Water Vodka undergoes an advanced mechanical osmosis process that forces the water through micro-fibers, filtering out 60% of the original water. This impure 60%, called “dross”, is discarded. The remaining 40% is the rarest, purest part of the purest glacier water available. Its natural aroma and flavor is intact, and the process ensures consistent quality every time. The name comes from the Second World War and the history of the Norwegian “heavy water sabotage”. This was a series of actions taken by Norwegian saboteurs during World War II to prevent a German nuclear energy project from acquiring a factory producing heavy water in Telemark, Norway, which because of its contents, could be concentrated and used to produce nuclear weapons. Between 1942 and 1944 a sequence of sabotage actions by a handful of Norwegian resistance fighters from the Norwegian resistance movement, ensured the destruction of the plant and the loss of the heavy water produced. These operations finally managed to knock the plant out of production in early 1943, basically ending the German research and quest to develop an atomic reactor and a nuclear bomb. The raid was later dubbed by the British SOE (Special Operations Executive) as the most successful act of sabotage in all of World War II. There has been a bunch of books written about this subject, and also a movie made from 1965 featuring Kirk Douglas, entitled “The Heroes of Telemark”. WHAT MAKES HEAVY DIFFERENT FROM OTHER VODKAS? First of all, the packaging! Hold the bottle next to another and look at and feel the glass. We spared no expense, using flawlessly clear, French glass. Next to our bottle, others look cloudy, grey, and uneven. It also is differently shaped than the majority of tall, frosted looking bottles out on the market. Heavy Water is a handcrafted, higher definition of vodka. Made from the finest Scandinavian winter wheat and the purest Swedish water, it’s truly artisanal vodka. Every detail is crafted to maintain the essence of vodka’s true characters while adding modern touches. The vodka inside the bottle is as good as vodka gets. 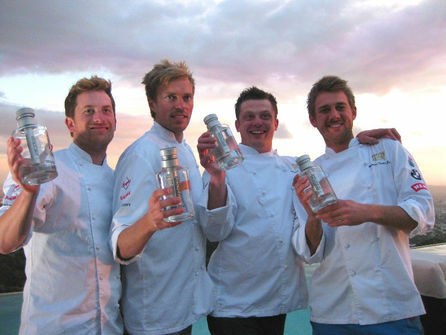 Heavy Water was developed by people who are extremely passionate and knowledgeable about vodka. They are perfectionists and spent years developing the formula that today is known as Heavy Water. They used only the best of Scandinavian raw materials and the water source is probably one of the cleanest in the world – everything about Heavy Water is pure and natural. The bottle was designed by a Swedish artist. WHAT IS THE PURPOSE OF THE ROD? As well as it being a great and fun way to display our logo, and winning the Gold Medal for Style & Packaging at the Vodka Masters last year. ‘Heavy Water is the only vodka – only beverage, in fact – that benefits from this built-in aeration rod which infuses oxygen into every pour, achieving the same result as decanting and swirling a fine wine in a glass. Aerated aromatics and flavors make Heavy Water vodka smell and taste better than any other vodka produced.’ Not a bad ice breaker!